There is a new lake/park in Waterloo Ill. which is being dedicated to veterans on Sunday November 11th. It will start at 1:00 p.m. The featured speaker will be a rear admiral Lee Metcalf, retired. There will be a band, barbecue and free beverages for the afternoon. The eagle will be there and available for photos. Bring your camera or cell phone for great pictures. A donation to World Bird Sanctuary would be appreciated. Friend, author, speaker and expert on Climate Change, Brian Ettling, is coming back to St. Louis for a couple of weeks this fall. He will be teaching his continuing adult ed Climate Change 101 class for St. Louis Community College at Meramec Campus on Saturday morning, October 13th. For additional information, contact the Office of Continuing Education at 314-984-7777. He is also willing to give a couple more talks while he is back in his home state of Missouri in mid-October. You can message Brian through his Facebook page if you’d like him to talk to your group. I’ve been a big proponent of Lynda.com for many years and now I just noticed that it is Free for St. Louis County Library Users. Lynda.com is a video resource and training company with a LARGE list of programs and skills which all of us need to learn and refresh. You will need to setup what they call a Profile at Lynda – just your name and email address. Note – normally this would cost $25/month. Here’s the link to setup an account. 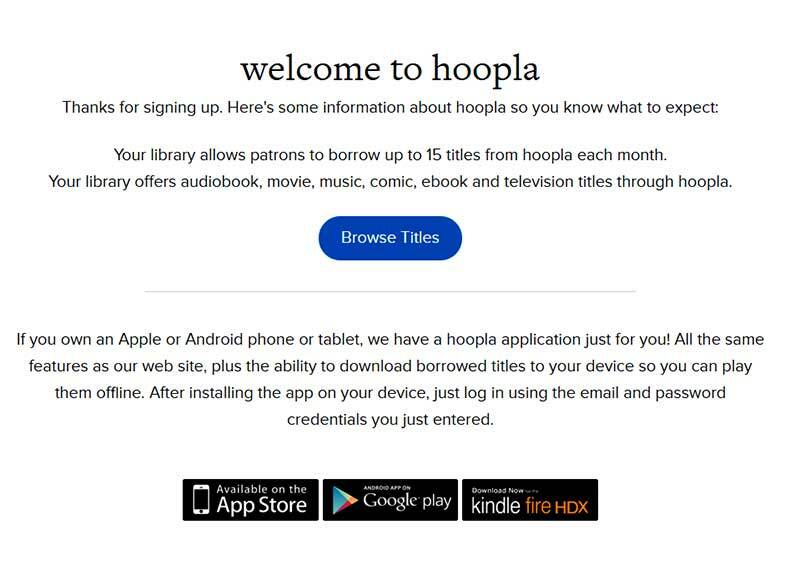 A Podcast is either an internet audio or video show which you can download and then listen at some future time. 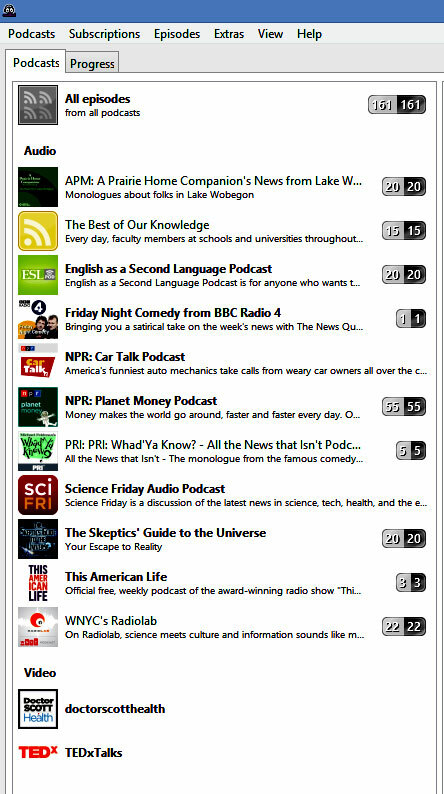 Since I’m not in the Apple Universe, I use Gpodder.org as a way to subscribe and download shows to my computer. I then move them to one of my devices and listen to the show at my convenience – usually when I’m gardening. Below are the shows I am now listening to – Car Talk is my favorite. My favorite device for this is a Sansa Clip which also has a slot for a SDHC card. Here’s the NPR podcast list. I was glad to be part of 100+ Veterans honored at Truman Middle School in Crestwood, Missouri. All the Vets got a chance to talk to groups of kids and answer their questions. At the end there was a big assembly and a standing ovation from all the kids. What was most emotional for me was that the kids lined the halls and applauded us all as we left the building. Thanks to John Fee for leading this effort at Truman. I for one am glad to see the spirit of respect and enthusiasm for our armed forces and veterans in our young people today. 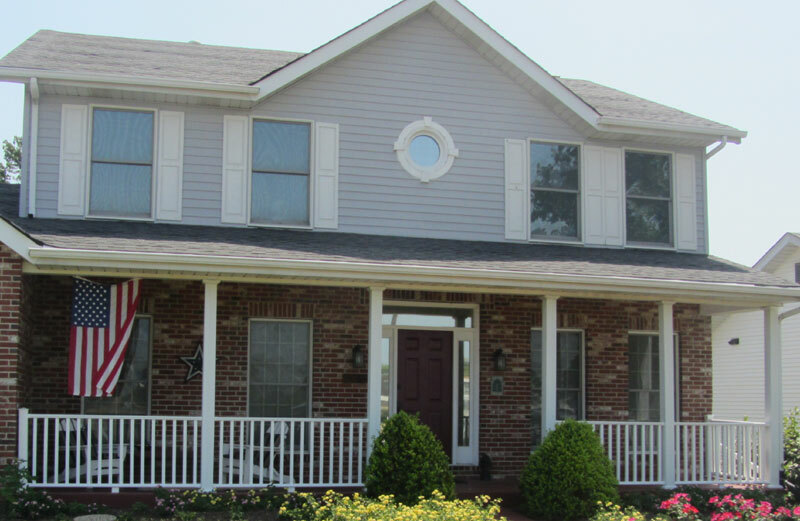 We stayed at this house for two weeks in May and had a great time. There doesn’t seem to be any way to give feedback or offer comments so I’m putting this information on my blog with hopes that at Google Search might help others. Directions are wrong – turn on A389 not 359. Charcoal BBQ. No chimney starter. You need lighter fluid. They also need a wire brush. They need a much better book of instructions. The stove in particular is quite different. No fans in the house. Toaster sets off the smoke alarm almost every day. We had to move the toaster to the dining area to overcome this problem. They need a knife sharper. Washing machine – push in On/Off button – push quick wash – push control knob in and turn it to 3. Use the line on the control. Bedroom 4 – largest – includes bathtub. Bed is soft. 2 extra bathrooms upstairs. No bathrooms downstairs except for outside toilet. Watch out – Steep – narrow stairs to 2nd floor. Stove is unusual – set top right to 280 degrees for cooktop. Trash – recycled – separate into colored plastic containers in the laundry room. Take out to curb on Thursday night. Trash is every Friday – Recycling is every other Friday, but they don’t tell you which Friday that is. Game room – has ping pong + snooker – don’t use pool balls as they are too large and get stuck. Walk – go down the road towards Pickwick Inn, then cut across the public path towards St Issey. 40 minutes. Americans – Bring electrical adapter for electronics. To lock new doors, hold up on handle and turn the key. To unlock, just turn the key. Restaurants -Pickwick Inn – down the road you live on. Good food and service 10 – 20 pounds. Nice lawn in the back yard. Its a good area to feed the birds and watch them. No store of any type in St Issey, but it does have a pub. Wadebridge Tesco is the nearest store. On A39 at first round-about turn right and go up about 200 meters. RingOBells pub is close, but the road is tiny in one section with lots of traffic. They have parking on the side. It’s a cute pub serving food 12 to 2 and 6:30 to 8 :30. Wifi is a very poor connection. Be careful driving when leaving -treacherous. While the average age of gamers today is 32, there’s a good argument to be made that Seniors might be the gamers of the future. Daphne Bavelier says that action packed shooter games have some positive effects on your body and brain. Vision is better. You can resolve small detail like the small print on many items. You can resolve different levels of grey – like foggy days driving the car. Your attention seems to get better – the ability to track multiple items. It’s interesting that this increased attention does not help with multimedia-tasking. Driving and talking on the phone is still a bad thing to do. Even if you think you’re good at multimedia-tasking – you’re really terrible. Daphne also makes the point that too much video game play is not good. She makes the point that a glass or two of wine every day might be good for your health, but two or three bottles a day would probably be bad. Finally, Daphne is trying to get the entertainment industry to come out with games that are not only entertaining, but also have the elements that would help the brain. Today, Friday, August 17th, is the day Seniors (65+) can signup for classes for $15 dollars. This is only for St. Louis Community College classes. When you fill out the form, make sure you list a number of classes which you might be interested in. Put “Alternate” in front of classes in case your first class is full or is not going to be held. I’ve been told by a teacher at the school that they need a minimum of 15 students per class and a maximum of 18. I got over to the school at 8am and there were 43 people ahead of me. Luckily the computers were down, so they just took the application and said we could pay on Monday. That sure beats waiting in line for the 43 people ahead of me. I’d suggest you take a picture of your registration form as they don’t give you any copy. Note #1- I gave them my form on Friday morning and Saturday in the mail I got my registration form back with my class enrollment and invoice for $15. They also called my on Saturday morning. I’m very impressed. Note #2 – after paying your fee, you need to go and get your student ID and parking pass. Before you go over there make sure you know your computer login information. https://selfservice.stlcc.edu/pls/SLCC/twbkwbis.P_WWWLogin both your ID and password. I’d recommend making a password that is not too hard. You will have to use it during the year to login to the school computers. Note #3 When you get your .edu email address, you can also then take advantage of the Amazon student free 6 month Prime account and then 50% off the regular membership. Note #4 – bring a large thumb drive to class – this is where you will keep a backup of your work. 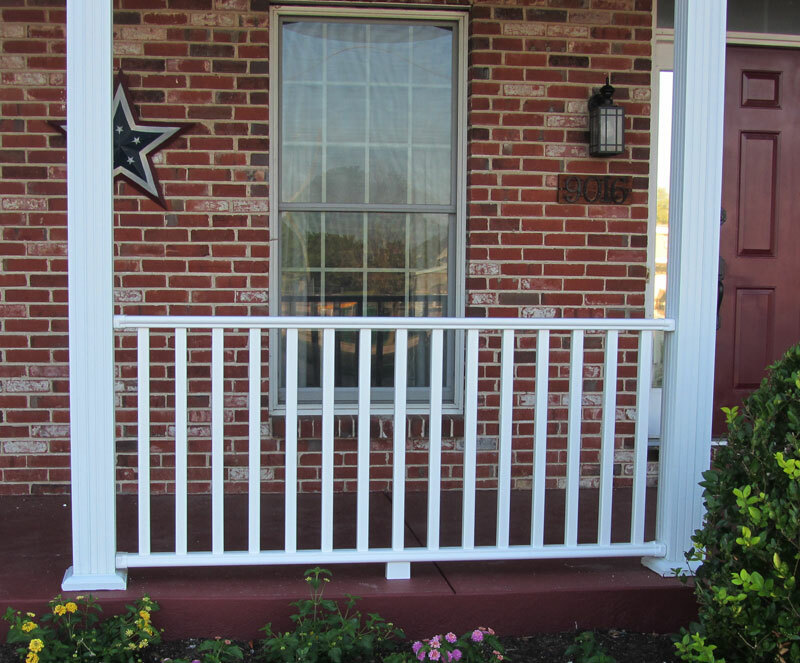 I bought my CertainTeed Kingston Railing from a local wholesale supplier and had it delivered to my home. 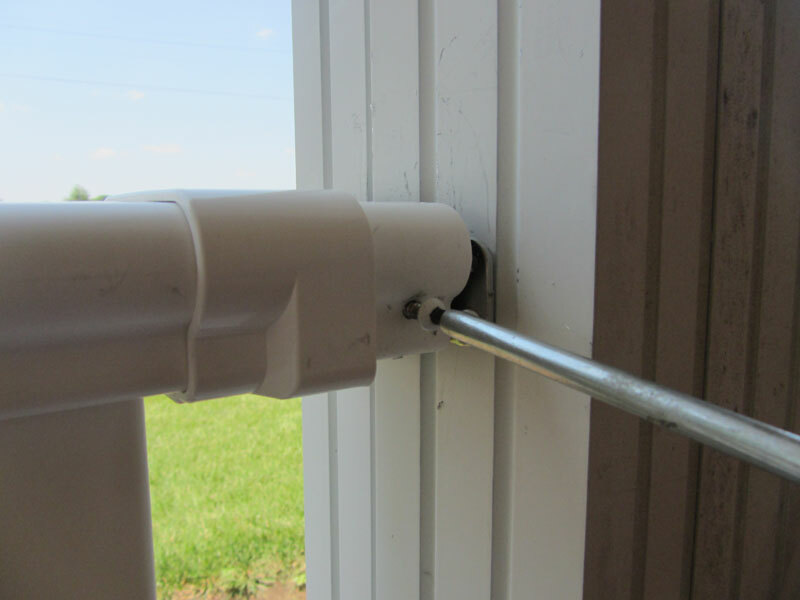 The railing has an aluminum core surounded with a vinyl covering. 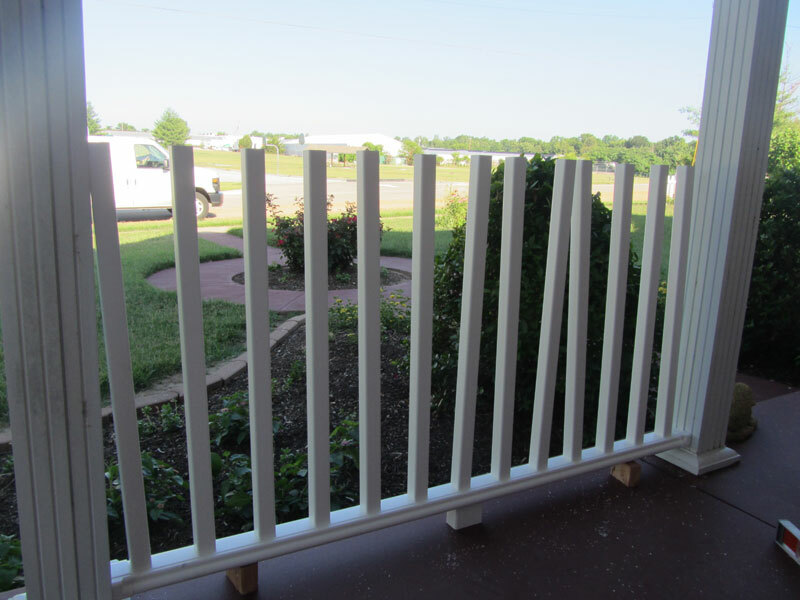 PLAN AHEAD – if possible put in your posts so that the railing balusters have at least two inches to four inches spacing at each end. If you have less than that your covers won’t fit easily. One thing you need to know upfront is that a 6 foot railing is actually 68 1/2 inches long. 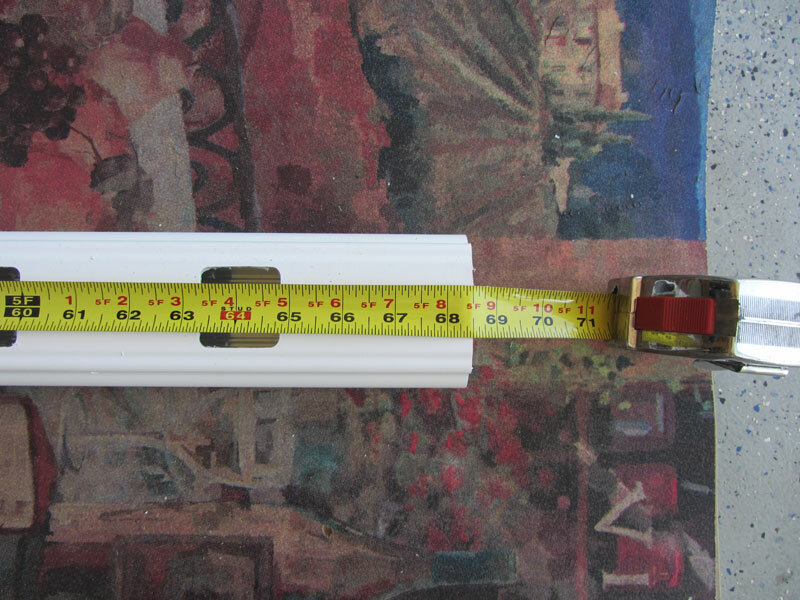 Similarly the 8 foot railing is not 8 feet, but is 92 1/2 inches long. The first chore I had is figuring out how to cut the railing. 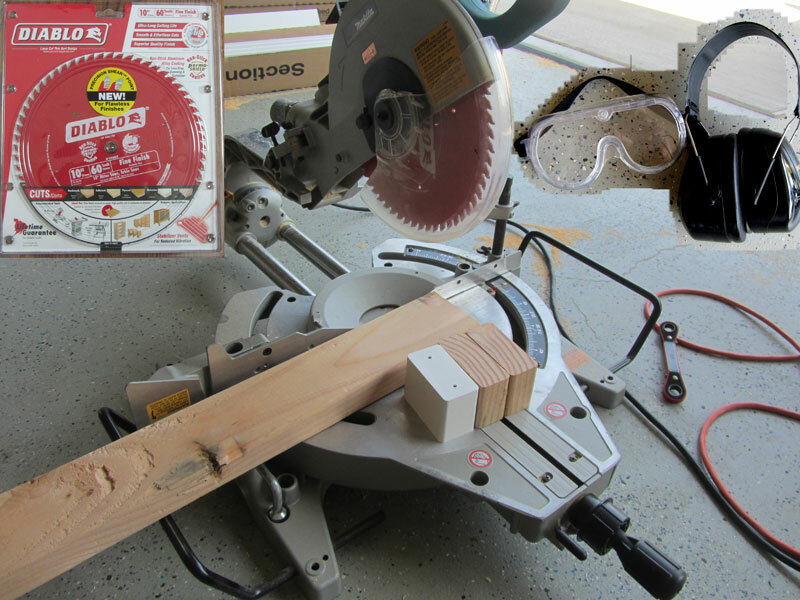 I ended up borrowing a friends miter saw and bought a carbide tipped 60 teeth 10 inch saw blade. You don’t need to buy a special metal cutting blade. Just make sure you get a carbide tipped blade. I could have gotten a 40 teeth blade, but went with the 60 teeth to get a finer cut. Take you time cutting through the metal. I also cut a wood support for the rail when I cut it on the floor to make sure my cuts are square. When you measure the bottom rail you want the slots to be equi-distant from both end supports. After you cut the railing you slip the covers on. 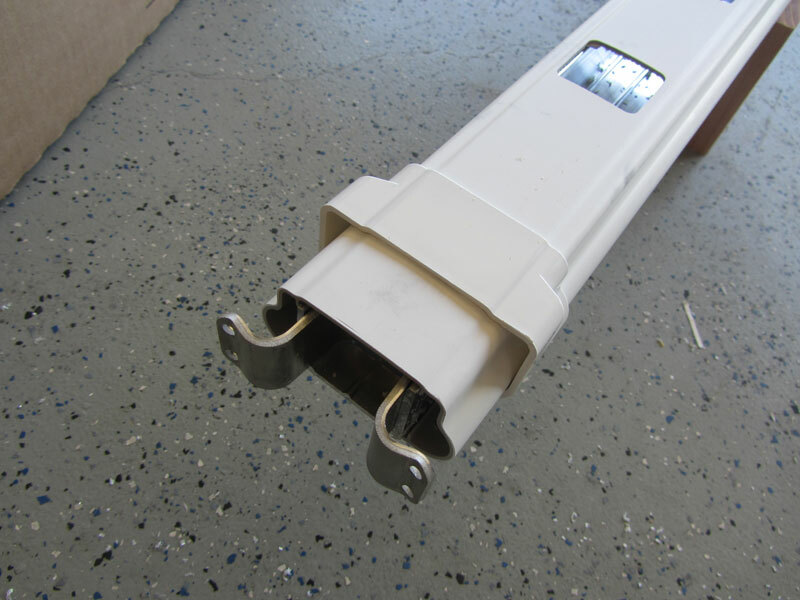 There are two ways the covers can go on, so make sure they go on correctly so that they cover the supports. Slide in the supports. I used a rubber mallet to get them in and still when I put the railing into place it was a bit tight. 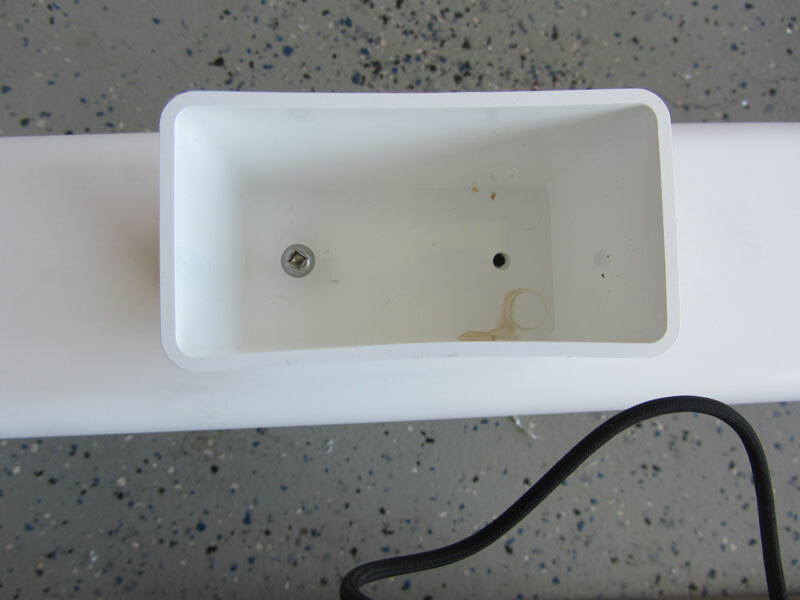 You might want to cut an extra 1/32″ extra off at the ends to get an easier fit. All of the screws require an unusual square bit for them, so you may be headed to the hardware store for this item. You only put in two screws per side on the rail. For the bottom rail you put screws in the top part of the support. I used a 9/64 drill bit for the pilot hole. For the top rail you put in two screws in the bottom holes. 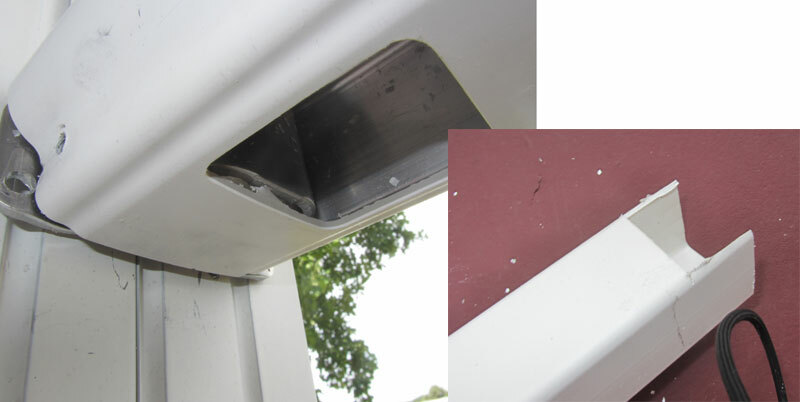 Then you can screw in the vinyl railing to the aluminum end supports. I used a 9/64 drill pilot hole. 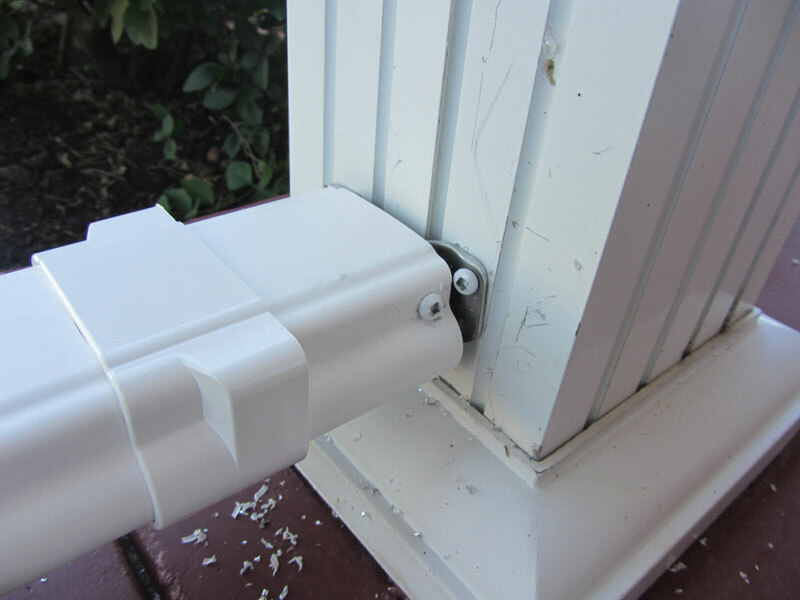 Try to be careful here so that the screw doesn’t stick out and stop the plastic cover from closing. I used the one inch screws for all these attachments. 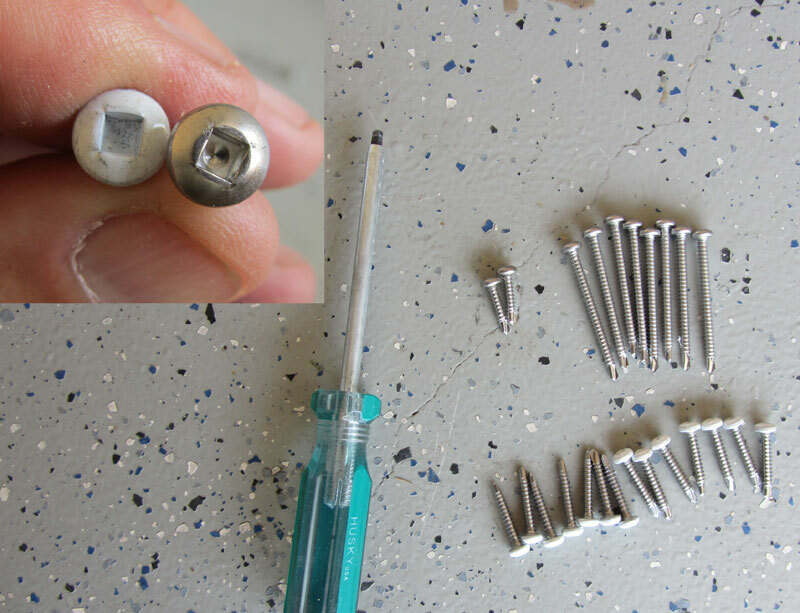 Note – they include some long screws, possibly for attaching to wood, but I never used these. 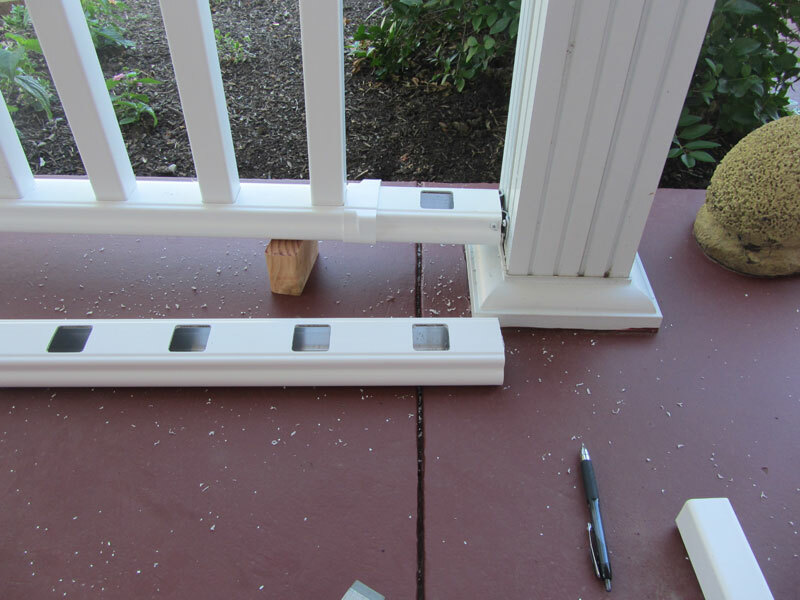 After you put in the bottom rail, you put in the square balusters. Make sure the top rail lines up perfectly with the bottom rail before you cut it. 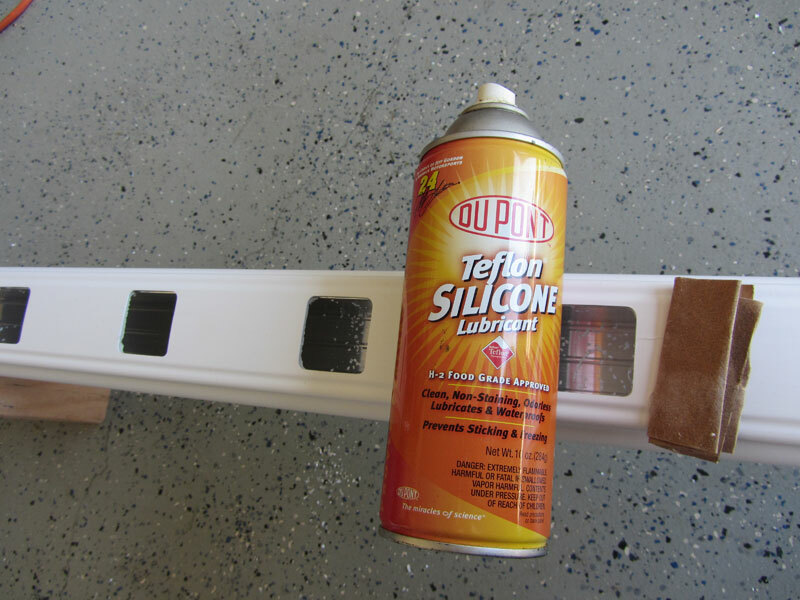 I then sanded and lubed the holes in top railing so that the balusters would go in easily. I also sprayed the balusters to make it easier to attach. You start from one end and work your way down. You then screw in the aluminum supports for the top rail and attach the rail to the support. 1. My posts weren’t perfectly level so I had a problem with the bottom rail shorter than the top rail. Ideally you would like all your posts straight and level. 2. 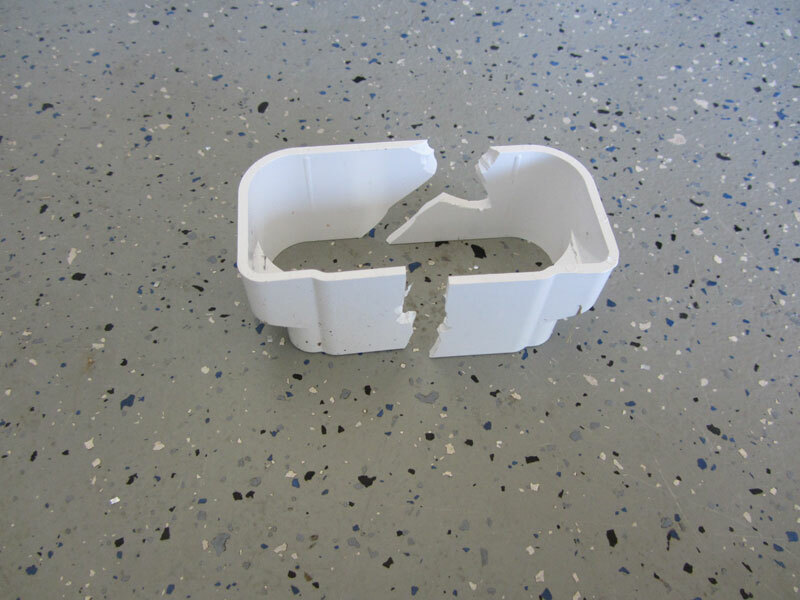 My 2nd problem is that I couldn’t fit one of my covers on and tried to cut it with my miter saw – it cracked and broke. You’re supposed to be able to cut this and bend it around the railing. I will try a hacksaw next time. Note – I called the Certainteed main office and they were nice enough to send out four free replacements, even though I only needed one. I did find that if you used a coping saw, you can easily cut the bottom middle part and then it fairly easy will slip over the railing end. 3. On one of my top rails I had a post very close to the end and the metal support was sticking into the post area. I had to cut out a section from the post for it to go into the hole. 4. Another thing I’ve learned is that once you have your top rail in place, check the balusters and try to move them up and down. Ideally, they won’t move much at all. If they do. then you know you have a problem. 5. My first drill bit only lasted for one railing. I bought the titanium metal bit – Id did last the rest of the project. 6. 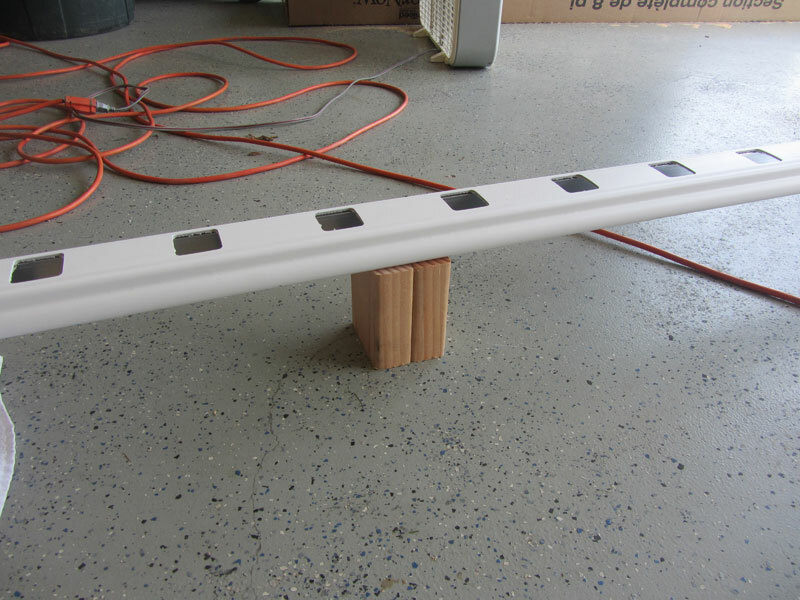 Drilling into concrete – I added two 38″ posts to the ends and had to connect them to the concrete. Not an easy job – even with a hammer drill. TIME: my first rail took about four hours as I took my time and figured out how to do everything. My 3rd rail took about 1 1/2 hours. 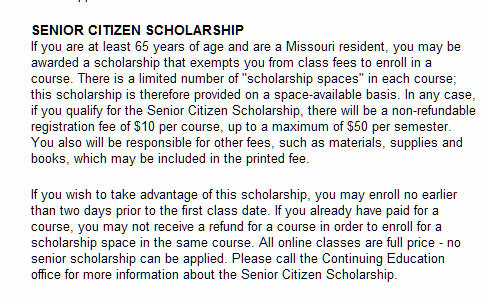 St. Louis Community College has a nice perk for anyone 65 and over – you can register for classes and it will only cost you $10 – on one page it says $15 -so the price may have increased. The only caveat is that you can’t register until the Friday before classes start – that is August 18th for the upcoming fall semester. Also, you might not be able to get the class you want if the class is full. You will need to go to the school in person to get a student ID and parking pass. If you’re between 60 and 65, you can register any time for half-price. With three tornadoes in the St. Louis area yesterday and one tornado just 600 meters from my house, here are some lessons learned. Have a Weather Alert radio. You may not hear the outside sirens. Our friend Karen had no idea that bad weather was in the area. Make sure you have one with a backup battery in case your electricity goes out. Turn on your TV to see how close the bad weather is and get ready to go to the basement. Go the basement early. Don’t wait until the last moment. Some people couldn’t open the basement door when the tornado struck. Being macho and watching the storm is STUPID. I also like having a TV in the basement to monitor the storm. You’ll know when the storm has passed. Just because it looks like the worst part of the storm is away from you – don’t count on it. It appeared to me that our area was not going to get hit very hard after watching TV, but boy was I wrong. Here is a more complete list below from government sources. – Can opener for food. – Chlorine bleach and medicine dropper – – – When diluted nine parts water to one part bleach, bleach can be used as a disinfectant. Or in an emergency, you can use it to treat water by using 16 drops of regular household liquid bleach per gallon of water. Do not use scented, color safe or bleaches with added cleaners. – Sleeping bag or warm blanket for each person. Any Catan Fans Out There? We just bought this game and it looks intriguing. 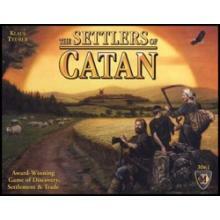 Any other Catan players out there? Once a week I electronically pick and choose certain magazines from our local library. What I didn’t realize is that they have 744 magazines to choose from. After a bit of searching I found a listing which shows all the magazine available in the St. Louis County library system. All you have to do is reserve them online nd pick them up at your nearest library. This is the best deal in town. Here’s the list. Consumer Reports has a list of things to have in the car for emergencies. I’d also advise to always keep half a tank of gas in your car in case your stuck somewhere. I’m always amazed at companies and how they seem to forget the basics of business. 3. 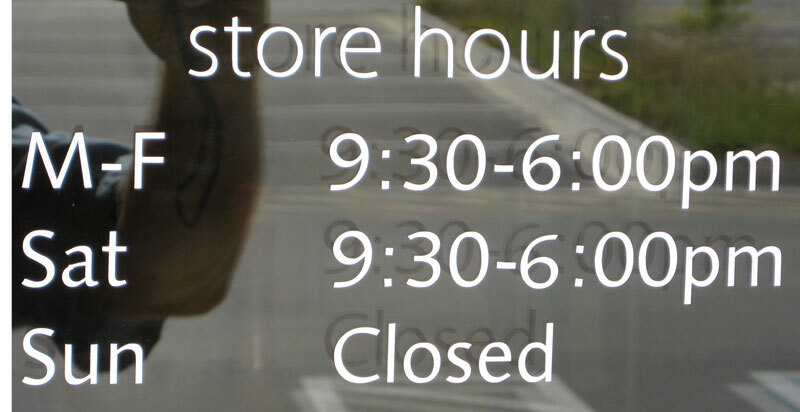 Their days and hours of operations. All they had was form to fill out with a basic map of their location. I filled out the form and decided to drive out and try to find their store. When we got to the store, this is what we saw. won’t recommend them to anyone else. How can they stay in business without doing the basics?